Luncheon of the Boating Party (1880-81) by Renoir. One of the greatest modern paintings of the nineteenth century. Location: Phillips Collection, Washington DC. One of the finest and most versatile of Impressionist painters, Renoir drew his artistic inspiration from many different sources. His first job, for instance, was painting patterns onto ceramic pottery; he also studied at the traditionalist Ecole des Beaux-Arts; copied works by Old Masters like Veronese and Rubens, as well as 18th century French painting, at the Louvre; and was influenced by both the colour of Delacroix and the realism of Gustave Courbet. A close friend of Claude Monet (1840-1926), with whom he often painted, he was renowned for his Impressionist landscape painting (notably his treatment of dappled light), and also produced some outstanding Impressionist portraits of men, women and children. Luncheon Of the Boating Party - acknowledged to be one of his greatest genre paintings - was created as he was beginning to switch from plein-air painting to studio work. For more on the Impressionists and their art, please see: Characteristics of Impressionism (1870-1910). For additional historical background, see: Realism to Impressionism (c.1830-1900). NOTE: For the story behind French Impressionism and the group of talented artists who created it, see our 10-part series, beginning: Impressionism: Origins, Influences. When Renoir completed this work, Impressionism was still the dominant style of modern art - a style characterized by its freshness and spontaneity, and by its introduction of new themes, notably everyday scenes of no particular significance. Luncheon Of the Boating Party - like his earlier masterpieces Dance at Le Moulin de la Galette (1876) and The Swing (1876) is a good example of this idiom. Set on a balcony at the Maison Fournaise restaurant overlooking the Seine river at Chatou, outside Paris, the painting appears to show a typically Impressionistic scene of friends sharing a convivial lunch together on a warm afternoon. A glimpse of a newly built railway bridge in the distant background confirms the modernity of the occasion, as does the carefree atmosphere and the informal dress of some of those present. 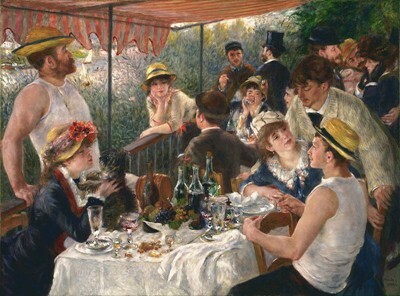 Painting in bright, warm colours, Renoir demonstrates his usual mastery in capturing the effects of light diffused by the striped awning overhead, and - using the table-cloth as well as the white singlets of the two men in straw boaters - in reflecting this light throughout the whole composition. However, despite its apparent spontaneity, the painting was very carefully put together, almost certainly in Renoir's studio. First, our attention is cleverly directed by the two men in straw boaters. Alighting on the man seated at the table (extreme right), our eyes follow his gaze to the man standing by the railing (extreme left), whose own gaze we follow along the railing to the man in the top hat. Here our attention is caught by the face and white-jacket of the man in the foreground, who leans over the woman in the white hat. The man's white jacket merges into the white singlet of the original figure, and the circle is complete. Second, the picture is actually three compositions in one. In the foreground, much of the space is taken up by a still life painting of bottles, glasses, grapes and other items. This would have been painted in the studio, using thick layers of paint. The figure painting of the fourteen or so guests (mostly friends or acquaintances of Renoir) who appear throughout the work, would also have been executed in the studio, either singly or in small groups. Loose brushwork is used on these figures in order to suggest movement. Lastly, the background landscape painting and the terrace itself would have been painted in situ - probably the only part of the picture that was done outside the studio. Sitting, holding a dog, bottom-left corner: is Renoir's future wife, the seamstress Aline Charigot, with whom he had three sons. By the railing: the man wearing the boater (left foreground) is Alphonse Fournaise, Jr, the son of the restaurant proprietor. The woman in the boater is Louise-Alphonsine Fournaise, the proprietor's daughter. Centre-right background: the man wearing the top-hat is Charles Ephrussi, the art collector and editor of the Gazette des Beaux-Arts. The younger man in the brown coat and cap with whom Ephrussi is conversing, is Jules Laforgue, Ephrussi's personal secretary. Just below them, drinking from a glass, is the actress Ellen Andrée. (The latter also appeared as the main character in L'Absinthe 1876 by Degas.) Sitting opposite her is Baron Raoul Barbier. Bottom right: the seated man wearing a boater and white singlet is the Impressionist artist Gustave Caillebotte (1848-94), who is talking with the journalist Adrien Maggiolo and the actress Angele Legault. Top right: the two men chatting to the actress Jeanne Samary are Eugene Pierre Lestringez and Paul Lhote, both close friends of Renoir. Luncheon of the Boating Party was first exhibited at the Seventh Impressionist Exhibition, held in rented rooms at 251 Rue Saint-Honore, in 1882. At least three art critics, including Armand Silvestre (1837-1901) of La Vie Moderne, considered it to be the show's best work. Renoir sold the painting to the influential dealer Paul Durand-Ruel (1831-1922), whose son sold it in 1923 to the American collector Duncan Phillips (18861966), for $125,000. For background, see: Impressionist Exhibitions in Paris (1874-86).  La Grenouillere (1869) Metropolitan Museum of Art.  Gare Saint-Lazare (1877) Musee d'Orsay, Paris. One of a series of the station.  The Road-Menders, Rue de Berne (1878) by Edouard Manet.  A Bar at the Folies Bergere (1881-2) by Edouard Manet.  For the meaning of other Impressionist genre paintings, see: Homepage.